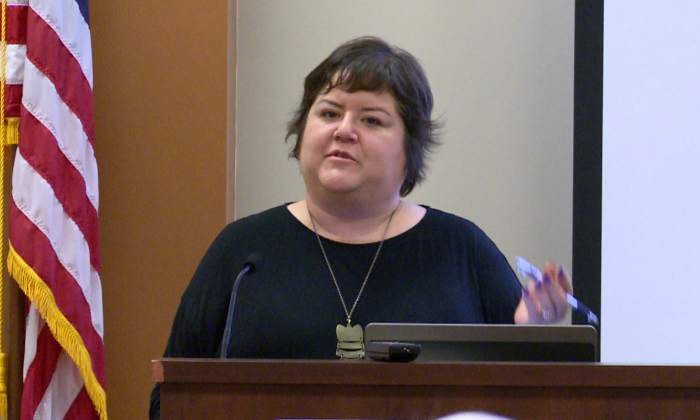 Marti Shaffer shared some common scam tricks with the public at the Alhambra Library. (NTD/Nina Liu). As the number of scam calls increases people are getting more and more frustrated by the intrusion and that includes sales representatives who come knocking at your door. The number of scams actually increases during the spring and summer months because the scammers tend to hire seasonal workers. Some of them were trained to pay extra attention to your outdoor alarm system sign. “They will come to you and say, ‘You’ll need to upgrade your system. I am from that company,’ or ‘That company is out of business, you’re no longer being monitored so we want to offer you a new contract.’ What happens is, none of that is true,” said Marti Shaffer, enforcement manager of Bureau of Security & Investigative Services (BSIS 916-322-4000). Customers should verify with their service provider first before taking any action. Shaffer also mentioned that you shouldn’t let such salespeople enter your house because some won’t leave until you sign a new contract or you get the police involved. If you signed a new contract, you will be responsible for both the old and new contract. Fortunately, her bureau can assist you for free over the phone, “You can file a complaint with our agency, BSIS.ca.gov, and we offer mediation through our complaint resolution unit. Typically these traveling salesmen, their contracts are not correct so we may be able to help you with the contract. We may be able to have the contract canceled. We can find other issues, assist you and mediate the problem,” Shaffer said. A locksmith should have license in California and the inexperienced one will often ruin your lock, “A really skilled, experienced, and knowledgeable locksmith will be able to open up almost any lock out there without having to drill (the lock). They will provide a written estimate and be upfront about the cost,” Shaffer added. Now people can easily find licensed contractors/professionals online through the Department of Consumer Affairs, DCA (800) 952-5210 or search by area or zip code, or Contractors State License Board, CSLB 800-321-CSLB (2752), which also helps the public solve issues like ‘the solar panel worker left me with a leaking roof but wouldn’t fix it.’ Another benefit of contacting the authorities is, “They will work with the licensee to get them in compliance also, so this doesn’t apply to other consumers,” said Shaffer.